Join the Access Basketball Ministry for a fun night of getting your bball game on at 10129 Emnora Lane, Houston, TX 77080 on Saturday 12/15 at 7 PM! Contact basketball@accesslive.org if you plan on coming so Dave Tien can get a headcount. Join the Access Basketball Ministry for a fun night of getting your bball game on at 10129 Emnora Lane, Houston, TX 77080 on Saturday 11/17 at 8 PM! Contact basketball@accesslive.org if you plan on coming so Dave Tien can get a headcount. Join the Access Basketball Ministry for a fun night of getting your bball game on at 10129 Emnora Lane, Houston, TX 77080 on Saturday 10/27 at 8 PM! Contact basketball@accesslive.org if you plan on coming so Dave Tien can get a headcount. 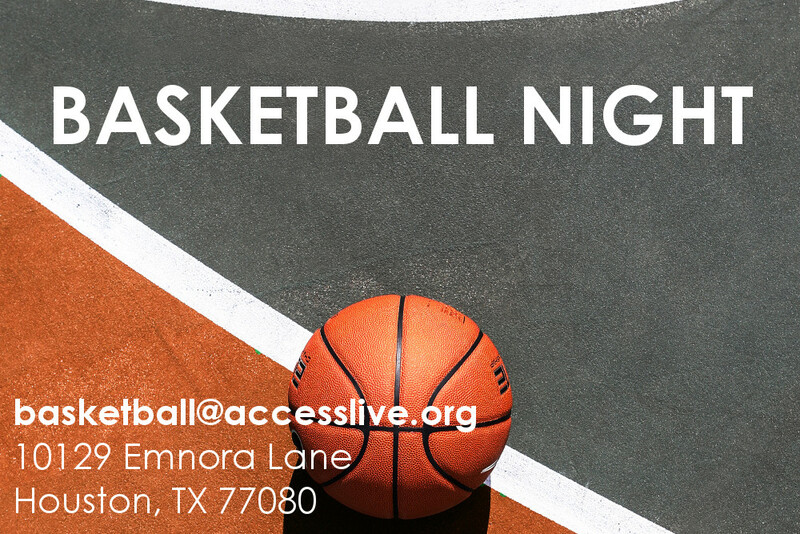 Join the Access Basketball Ministry for a fun night of getting your bball game on at 10129 Emnora Lane, Houston, TX 77080! Contact basketball@accesslive.org if you plan on coming so Dave Tien can get a headcount.